DAUPHIN ISLAND, Ala. -- A $1.5 million congressional appropriation gave Dauphin Island a positive surge Monday in its efforts to shore up its precarious west end. The money sought by U.S. Rep. Jo Bonner, R-Mobile, will fund a study of stabilizing beach erosion. The study, headed by Scott Douglass, a professor at the University of South Alabama and a noted coastal engineer, will go a long way, both men said Monday, in addressing erosion problems that plague the island. U.S. 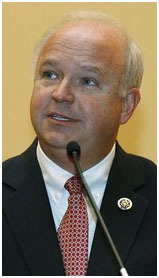 Congressman Joe Bonner, R-Mobile, "Dauphin Island's role shielding coastal areas from the brunt of storms is one that we can no longer afford to take for granted." "Dauphin Island's role in shielding coastal areas from the brunt of storms is one that we can no longer afford to take for granted," Bonner said. The island serves as a natural shield for south Mobile County by reducing high water and wave intensity during major storms. If this protection were to be jeopardized, so too would be that for estuaries, marshes, oyster beds and inland homes and development, Dauphin Island Mayor Jeff Collier said. The west end breach has been cited by fishermen as one of the causes of higher salinity in the Mississippi Sound, leading to an increase in predatory snails -- oyster drills -- that have decimated area oyster reefs, Collier said. Bonner said that action to rebuild the natural barrier and stabilize erosion was a good investment for people of the island and coastal areas of the county. "We cannot control the frequency or intensity of future storms, but we can better utilize natural protections, such as our barrier islands, to lessen the severity of local destruction," he said. The study will consider beach nourishment as an answer, Douglass said, pointing out that both Orange Beach and Gulf Shores have succeeded in stabilizing their coastlines through sand replenishment. The congressional funding, Douglass said, will help determine whether such beach nourishment can solve some of the island's problems. Douglass said he envisions one solution incorporating "large amounts of sand -- millions of cubic yards" being taken from deposits now sitting in huge quantities offshore in the Gulf of Mexico, not far south of the island.